This examination of a near plane crash shows that while people may fall, true heroes always work to rise again. Emilio Corsetti III explores how quickly real-life heroes can be recast as villains, in Scapegoat, which follows a pilot who stops his plane from crashing. TWA flight 841 was on a routine flight from New York to Minneapolis when the plane inexplicably took a nosedive. After Captain Harvey Gibson and his crew pulled the crippled plane out of the dive, mere feet from the ground, they were at first hailed as heroes. But then investigators discovered that the in-flight recordings were partially erased, and the crew was accused of covering up negligence. Gibson and his crew found themselves fighting misinformation and rumors, and stonewalling to clear their names. Scapegoat is a taut, suspenseful history. The opening chapters prompt heart-pounding excitement as Corsetti describes the dive from the perspective of both the crew and the passengers. The book is enthralling throughout, even as it shifts from the near crash to the more mundane hearings and investigations that followed it. The text is very detailed, its investigation leaving no stone unturned. It even provides the development history and schematics of the Boeing 727, with diagrams that explain the malfunction. Corsetti proves skilled at mining the investigation for drama; he uses transcripts from trials and depositions, media interviews, and even personal correspondence to recreate tense and dramatic scenes. But the true strength of the book is in how well Corsetti explores the tragic stories of his real-life characters, especially that of Captain Gibson. His downfall comes not because of vanity or pride, but because of his vulnerability; grappling with shock, Gibson doesn’t give the authorities a complete picture of the crash. Corsetti’s text ends up presenting Gibson as a hero not only for stopping a plane crash, but also for untangling himself from the misinformation and deception around him. 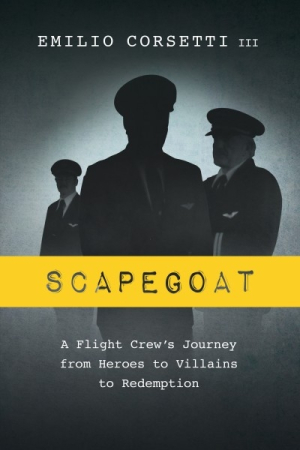 Scapegoat will appeal to aviation enthusiasts, history buffs, and anyone who enjoys nonfiction thrillers. Corsetti’s book is a near-perfect examination of a moment in history—before the sensationalism of the twenty-four-hour news cycle, before passengers could share cell-phone videos of a bad flight on social media, and before terrorism changed the way that people feel about flying. More importantly, the story shows that a person may fall to earth, but a hero always tries to rise again.